We are all familiar with the verses for today. But how many of us actually apply them to our daily lives? 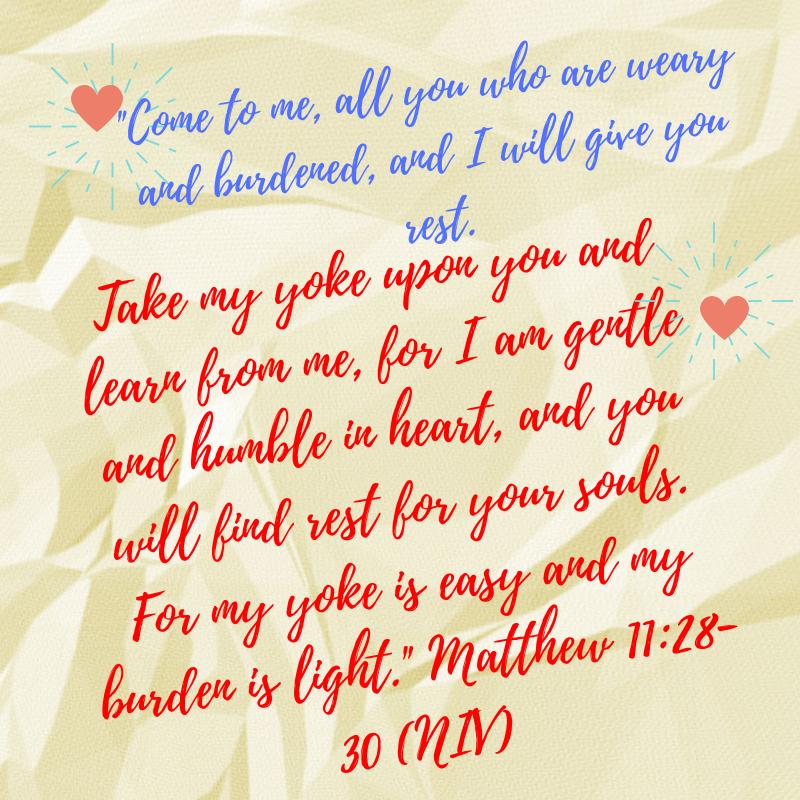 At times, when we work and work so hard, it is time for us to rest at the feet of Jesus. We may response by saying, “But I don’t have the time to rest. I have so much to do and I am already behind on what I need to do.” It is true. We have lots of things to do. But we cannot afford not to rest. Studies have shown that rest rejuvenates us. And when we are rejuvenated, our productivity increases. To some people, rest may seem a waste of time. But it is not. Rest is a time that we can get replenished and refreshed so we can have more energy to do more later. If our Heavenly Father rested after taking six days to create the earth, how much more should we rest. And how much more should we rest specially if we are tired and burdened with finances, work, etc. We need to release life’s stress in our body by resting. Resting in the presence of God will give us peace from our stress. It will give us an opportunity to commune with God and hear from Him. So, my encouragement today for us is to rest and soak in the presence and Glory of God. Father in Heaven, help us to rest at Your feet. Help us to cast all our burdens at the foot of the cross. Give us Your peace and speak to us about the direction of our lives. In Jesus’ Name. Amen. Psalm 23 has been ranked as the top 5 or top 10 most popular psalm. I know that I love Psalm 23 and have memorized it, specially in the King James version. To me, the psalm is so soothing and encouraging. It started with the assurance that Jesus is our shepherd. In addition, the shepherd cares for the flock, administers medical treatment to sick sheep, shears the sheep’s fleece, keeps the flock from attacks of predators, and the list goes on and on. With Jesus as our good Shepherd, He does what earthly shepherds do. Jesus cares and protects us. He keeps watch over us day and night, night and day. He heals us by His stripes. John 10:11 (NIV) reiterated Jesus as our shepherd: “I am the good shepherd. The good shepherd lays down his life for the sheep.” As we know, Jesus did exactly that. He died on the cross so we can have everlasting life. Think about it on a deeper level. Jesus laid down his life for us. He bore every sin that we have committed so we can be free. Let that soak into our spirit. Jesus loved us so much that He was willing to give up His life for us. Only a good shepherd would do that for His sheep. With that thought, don’t you sense a relief from the burdens in life? Don’t you sense that nothing can touch you that will harm you? Don’t you sense that Jesus cares so much about you? I do. After meditating on Jesus as my shepherd, I experienced a release from the concerns of life and felt that I am under the protective hands of Jesus. 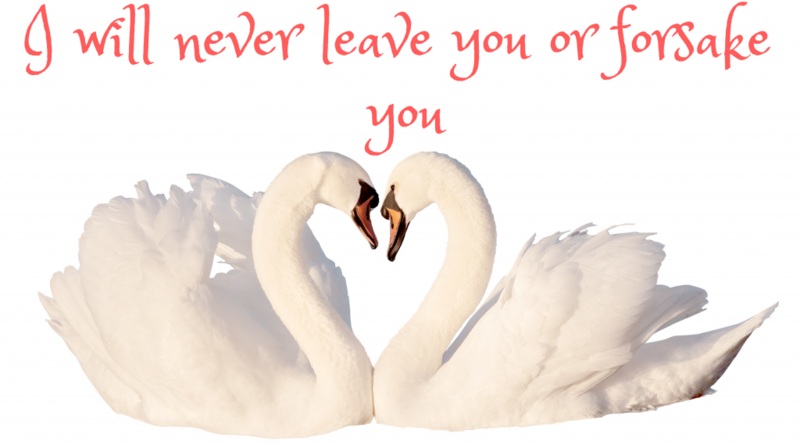 Hebrews 13:5b (EHV): For God has said: I will never leave you, and I will never forsake you. 1Chronicles 28:20 (NLT): “Be strong and courageous, and do the work. Don’t be afraid or discouraged, for the Lord God, my God, is with you. He will not fail you or forsake you. 1Kings 8:57 (NIV): May the Lord our God be with us as he was with our ancestors; may he never leave us nor forsake us. Deuteronomy 4:31 (NASB): For the Lord your God is a compassionate God; He will not fail you nor destroy you nor forget the covenant with your fathers which He swore to them. Isaiah 41:10a (NIV): So do not fear, for I am with you; do not be dismayed, for I am your God. Joshua 1:5 (NLT): No one will be able to stand against you as long as you live. For I will be with you as I was with Moses. I will not fail you or abandon you. Psalms 37:28a (ESV): For the Lord loves justice; he will not forsake his saints. Did you know in the animal kingdom there are certain animals that stay together forever? The swan is an example of one. According to Wikipedia, male and female swans form a “socially monogamous pair” and “bond from as early as 20 months that last for many years, and in some cases these can last for life.” Other animals that bond together for life are: bald eagles, black vultures, barn owls, gray wolves, seahorses and others. I believe that God used the animal kingdom to show us that once we are in Christ, we are bonded with God forever and ever. He will never leave us or forsake us. The many Scriptures in the Bible constantly remind us how God will always be with us, even to the end of times. That is pretty strong language. There really is no room for us to doubt that God will leave us because of His adamant Word to us that He will never fail us or abandon us. Merriam-Webster defined never as: not ever, at no time, not in any degree, not under any condition. What is so strong about the word never is that no matter what, never is never. That is the promise God has for us, that He will never forsake us, never leave us, never fail us, never abandon us. And if you are going through a tough time right now, know that all things will pass. And in the midst of the tough times, whether it is caused by relationship failing, financial woes or other issues, meditate in your heart that God is there with you. He knows what you are going through. He is always beside you. It doesn’t matter if we blew it in life, God still loves us so much. He will not leave you because you messed up. He is right there with you, to help you and see that you go through this valley. So, take heart and encourage yourself in the Lord. Say: God, I know that You will never leave me or forsake me. I receive that and bless me, God. In Jesus’ Name. Amen.